A new infographic by rewarded search site Qmee offers a glimpse at the digital doings that occur globally over the span of each minute. “Online In 60 Seconds” is a pie chart that shows off the sheer amount of online activity that takes place every single minute. The amount of YouTube videos uploaded has already increased from January 2012’s 60 hours per minute to 72. Additionally, over 1.8 million things are liked on Facebook, and 278 thousand bon mots tweeted. Not depicted in the chart: the amount of work that is going undone while all of these items are being viewed. To read more, click here. 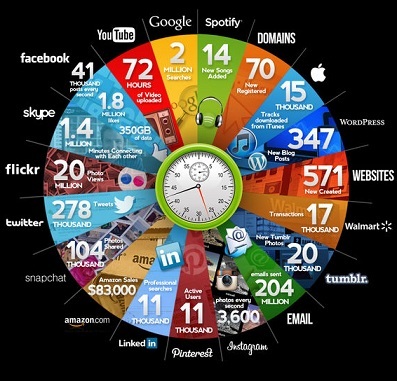 Tags: "Online In 60 Seconds", Fast Company, Infographic, Qmee, The Internet in 60 minutes. Bookmark the permalink.